Everything you need to start a lifelong energy practice in the qi gong tradition. The qi gong masters say that looking for happiness in the outside world is like trying to catch the wind in a net. If we want true fulfillment, tranquility, and joy, we must cultivate them from within. It was for this very reason that the ancient sages first developed the art of qi gong—or working with life-force energy to bring forth healing, inspiration, and wisdom. Qi Gong for Health and Healing immerses you in a comprehensive training course in the essential techniques of this celebrated practice. Your instructor is Lee Holden, a teacher respected worldwide for his ability to make these transformational skills accessible to modern students. Qi Gong for Health and Healing contains everything you need in order to create and sustain a customized practice rooted in centuries of tradition. 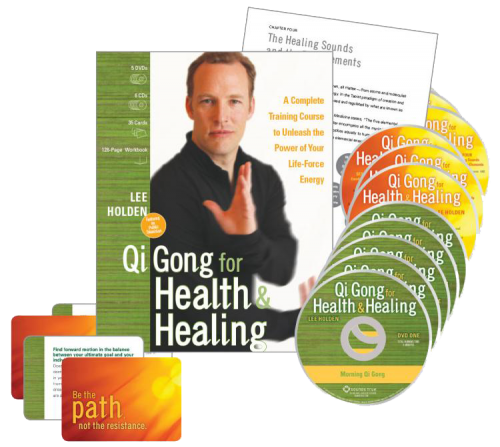 Five DVDs provide your qi gong workouts, with six hours of foundational exercises for morning, evening, self-healing, emotional balance, and spiritual qi gong. Six CDs complement the video instruction offering a series of qi-infusing guided meditations. The beautiful deck of qi cards gives you on-the-spot inspiration along with practice themes and pointers. Your workbook features energy self-assessments, a glossary of acupressure points, practice overviews, and tips for “qi gong cross-training,” namely combining exercises to address specific areas of concern. All of these tools support the primary goals of qi gong: increasing the flow of life-force energy, boosting immunity, and clearing out stress and tension to help us reach our full potential. People who regularly practice qi gong report truly remarkable results, from starting every day full of vitality, to overcoming serious illness, to genuine spiritual awakening. “One thing is certain,” explains Lee Holden, “The more you engage in the practice of qi gong, the greater your return will be.” With Qi Gong for Health and Healing, you can begin to experience for yourself this gentle, natural, and complete method for discovering life's greatest treasures from within. This is a great course for anyone interested in qi gong. Well presented and comprehensive information on Qi Gong. So well set out and easy to understand,I just thought it was one of the best Qi Gong programmes I have done.